A long-standing relationship with Macmillan Cancer Environments and our work across a number of oncology projects means that we are sensitive to the particular needs of people affected by cancer. Stress, disorientation and confusion, fear and anxiety may be alleviated by the appropriate use of art to welcome and reassure, support way finding, convey quality of care, and create a homely and friendly atmosphere. Illustrator helps to create a unique and welcoming environment, appropriate for young people, on behalf of Teenage Cancer Trust. Patients are being invited to stamp their own identity on their space in hospital using a series of sculptures inspired by books and reading. Integrated artworks support the patient journey and create a sense of local ownership and pride. 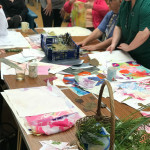 Artworks created in response to workshops with patient, staff and carers.